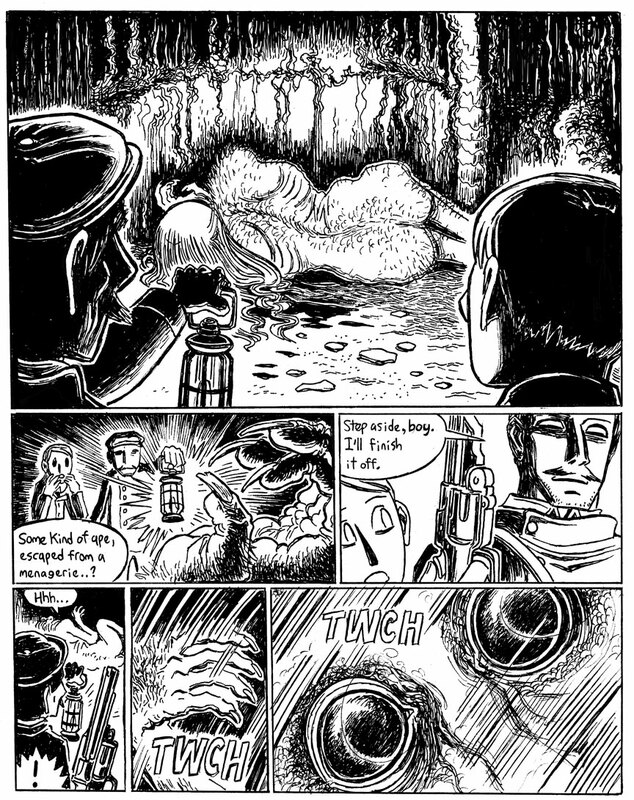 Just one more page to go of my quick-and-dirty, drawn-much-quicker-than-normal adaptation of H.P. Lovecraft’s teenage short story, “The Beast in the Cave.” This week is really busy for me, and on top of everything else, this weekend I’m going to Stumptown Comics Fest in Portland, Oregon! If you’re in the area on April 27-28, please come by Booth P-10 which I’ll be sharing with my friends Karen Luk and Chloe Dalquist from the Couscous Collective. Note that I may actually be hiding in the cafe drawing, trying to meet my current deadlines, so don’t be surprised if Chloe & Karen point you to thataway if you’re looking for me. I’d love to say hi and talk even if I’m drawing while I do it. If you’re at Stumptown on Sunday afternoon, from 1-2 PM, come to room B113 to try out my new tabletop game: MANGAKA: THE FAST & FURIOUS GAME OF DRAWING COMICS! To quote from the program guide: “Draw the world’s greatest comics… or die trying! Mangaka is the stepchild of Pictionary, Telestrations and Dominion, (Actually, I’d say it’s more like Fluxx or Munchkin than Dominion) a fast-paced card game for artists and storytellers where every round involves drawing cards and drawing comics. Fulfill your Obsessions, follow Trends, avoid Impairments, and compete with your fellow players to tell the greatest comic stories imaginable, even if you can’t even draw a stick figure! For fans of manga, graphic novels, webcomics and anyone with a sense of humor. Pens, paper and cards provided.”. I’m very proud of the work I’ve been doing with MANGAKA!, with thanks to my friends who’ve helped me playtest it, and even if you normally don’t draw, I think you’d love it if you tried it out. NEXT UPDATE: Sorry, but I won’t be able to put up the final page of Beast ’till after Stumptown after all (I want to make some corrections). Come back next week for the final page! Lovecraft’s idea of a degenerative form of adaption. A kind of “reverse evolution” he liked to use. (So did other writers of that time.) A place where science gives way to atmosphere and story. Weird science. What I worked out for what happens to humans who become ghouls is s stepped process of alteration, not degeneration. The final part is the black grave yard mold of an previously unknown variety that is last to manifest in the one way metamorphosis from human to ghoul. They have long lives and are very hard to kill. I was under the impression that Richard Upton Pickman had been around for over 200 years when he disappeared. The fully formed ghouls knew what he was and so didn’t harm him. Nice work, I am enjoying this. I recall reading that story awhile back. One of his few surviving early stories he had not managed to destroy.